Connor McDavid's stat sheet for Tuesday's game against the Pittsburgh Penguins will record five shots, three blocks and one goal. What it won't show are five words the young superstar uttered in the locker room after an extraordinarily entertaining game his team had just lost 2-1 in overtime: "We've just got to relax." Connor McDavid's stat sheet for Tuesday's game against the Pittsburgh Penguins will record five shots, three blocks and one goal. What it won't show are five words the young superstar uttered in the locker room afterward, his hair still damp from the shower, his face still rouged from the exertion of an extraordinarily entertaining game his team had just lost 2-1 in overtime. "We've just got to relax," he said. It seems a simple thing, but the phrase cuts directly to the heart of the matter. With those five words, McDavid put a stethoscope to the recurring malady that has plagued the Edmonton Oilers for the past seven games: an offence with a barely perceptible pulse. The Oilers will return home from this three-game road trip with one win, one regulation-time loss and one overtime loss. When they left Edmonton they were walking wounded, with frail goaltending, a shaky defence and a sputtering offence. Away from home, they cured some of those ills. As Meatloaf once said, two out of three ain't bad. While away from home, goaltender Cam Talbot found his game, and the defence suddenly remembered how to play in front of him. Over three games in Chicago, Philadelphia and Pittsburgh, they surrendered a measly five goals. But the offence scored only four. Even students of the "New Math" know that ain't good. Four goals in three games table scraps. They've been surviving, barely, on the same starvation diet for seven games now. So this condition, for the moment, appears to have become chronic. The Oilers have fired 302 shots on goal in eight games this season. They've scored 15 times. A team shooting percentage of 4.9 per cent is half what it should be. Last season, that percentage was 9.54. When pucks aren't going in, several things happen. Players are reluctant to shoot when they should. They try to make perfect shots and miss by inches. They hesitate. They second-guess. Confident players just rip it at the net. Goals build confidence, which leads to more goals. And so on. You get the sense that if these guys just keep shooting, if they "relax" and trust their skills, pucks will start going in. But enough of that – time to talk about what went right. For starters, Talbot played brilliantly, again, in Pittsburgh. Over a span of more than two periods, he stopped every shot he saw, and some he didn't. He was finally beaten on a wrist shot by Ian Cole that threaded its way through a congregation gathered in front of the net. But Matt Murray played copycat at the other end of the rink, and matched him save for save — until McDavid beat him with a wicked wrist shot, high glove-side, to tie the score with three minutes left in the third period. The Penguins won the game on a Phil Kessel goal, 42 seconds into overtime. The inquisition began while the red light behind Talbot was still flashing. Fans on Twitter and radio call-in shows wanted to know why the less-than-fleet-footed Milan Lucic was on the ice in 3-3 overtime. A lumbering power forward, whose strength is best displayed during combat along the boards and in the corners, Lucic was part of the second Oilers trio over the boards in the extra period. 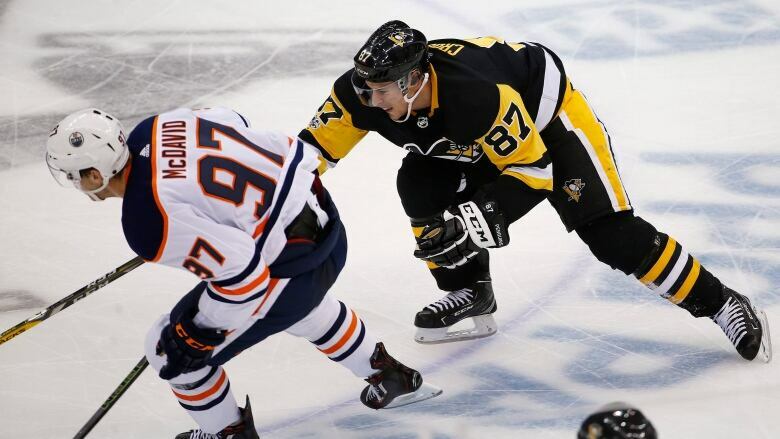 He and linemate Ryan Nugent-Hopkins broke in on the Penguins net but missed on their chance, which created, as it often does, an odd-man rush the other way. As Evgeni Malkin lugged the puck into the Oilers' zone, Lucic and Nugent-Hopkins skated hard to get back. They weren't fast enough. Malkin slipped a pass across to Kessel, who fired the winner home. 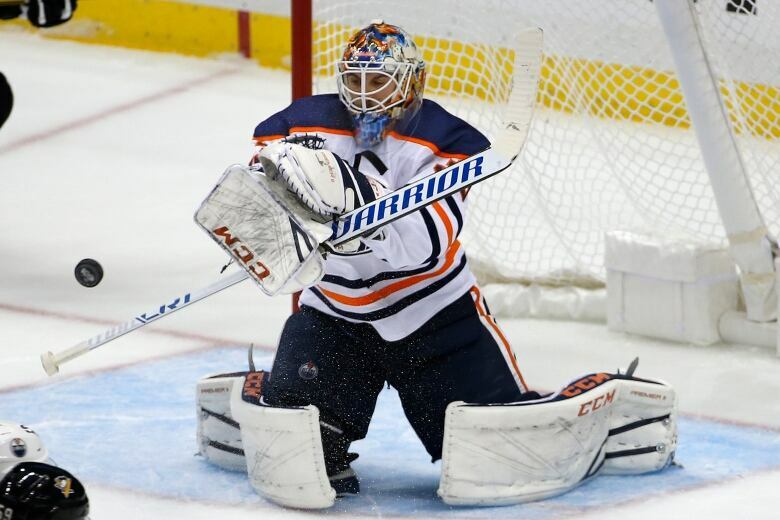 No one can fault the Oilers' effort on Tuesday night, or in the two previous road games. They continue to generate scads of scoring chances. Mark Letestu had the best one Tuesday evening, and missed a goal by precisely 3.5 inches. After a perfect pass, he faced a gaping net. But a desperate Murray reached out with his stick, 3.5 inches wide at the paddle, and guess what the puck hit? That pucks goes in 99 out of 100 times. Oilers coach Todd McLellan said he liked his team's overall effort. He was pleased his players appear to have cleaned up the defensive lapses that plagued the team at home last week against Winnipeg and Carolina. The next step, he said, will be to find some anti-venom for a snakebitten offence. Asked about his team's scoring woes, he offered his own expert diagnosis. "It's almost like we're squeezing it so tight that we ether pause or we shoot it a little too quick," he said. Which was exactly what his captain said, in five well-chosen words. The Oilers return home to play the Dallas Stars on Thursday and the Washington Capitals on Saturday — both teams that can score goals in bunches. Rick McConnell has a boxful of journalism awards buried somewhere in his basement. He covers the Oilers and toils as a copy editor for CBC Edmonton.